We were ushered into the water with little ceremony – “The sea lions are over there, the sharks are over there.” Though the words were anticlimactic, nothing could diminish my excitement. 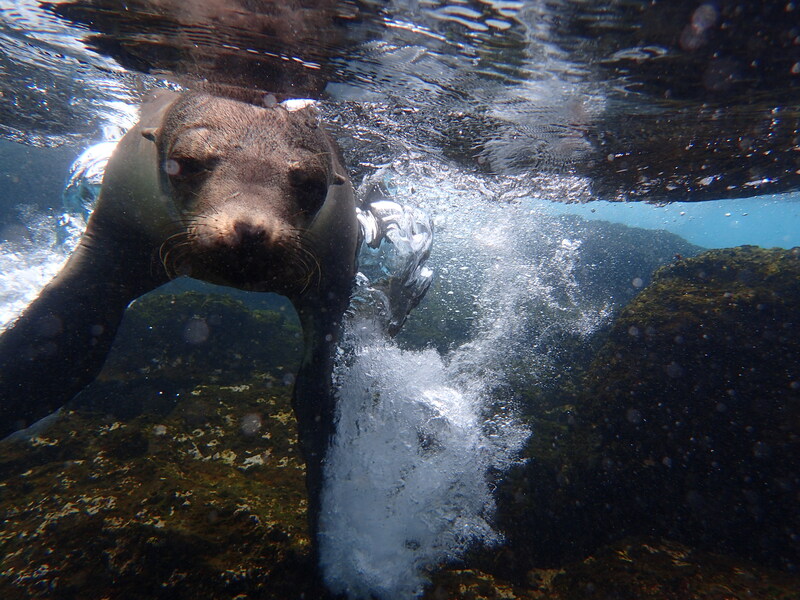 It was my first full day in the Galapagos and I was about to swim with sea lions. I adjusted my mask, and stepped off the boat into the Pacific. As I swam towards the rocks around which the sea lions purportedly played, I was giddy with anticipation. I powered past schools of bait fish without a second glance. I had a goal and nothing was going to distract me. Suddenly a lithe, brown shape skirted through the corner of my field of view. I caught my breath and turned towards the movement – nothing. I squinted through the water, doubting whether or not I had seen anything. And then, the sea lion was back. He circled me and the other snorkelers, zooming effortlessly through the water. He was soon joined by another. Together they somersaulted through the water, weaving between us with ease. One of the two swam right up to my face and floated quietly nose to nose as I snapped pictures. Then, without warning, he splashed the surface of the water and, as I flinched, veered off underneath me and away. Watching him repeat the same behavior with others, it became obvious that he was laughing at us, purposefully provoking a reaction. A different individual had a similar strategy, surprising unsuspecting snorkelers by shooting a stream of bubbles into their faces. Eventually I forced my attention away from the comedic duo and began to look around. Schools of bait fish and surgeonfish were everywhere. Blue-eyed, yellow-tailed damselfish watched me from their rocky crevasses as I slowly meandered towards where the sharks were supposed to be. 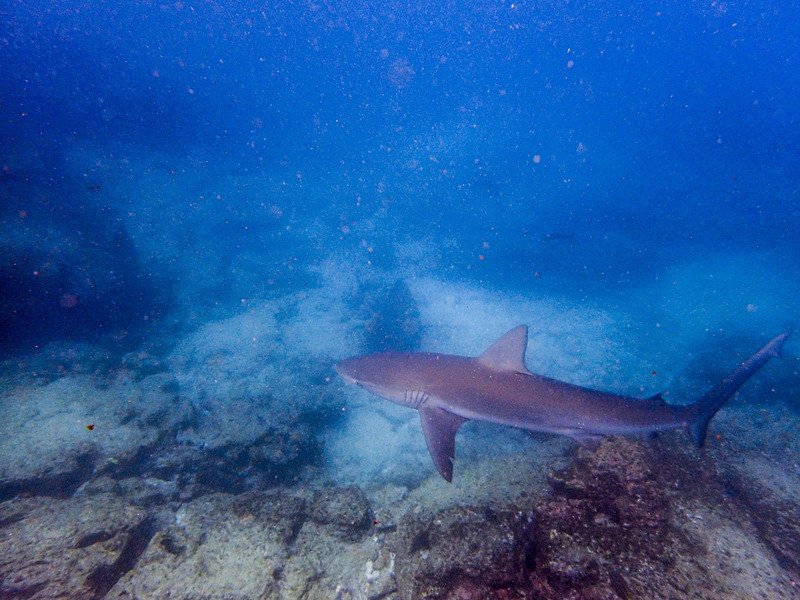 Near the sharks’ territory I glanced over my shoulder to see a Galapagos shark a few meters behind me. I watched him with the tiniest bit of apprehension – he was big –but he showed no interest in me or any other of the snorkelers. Feeling comfortable, I swam parallel to him for a ways until he moved off into deeper waters. As I made my way back toward the boat, I was grinning like a goof around my snorkel – sharks and sea lions, what could be better? Popping my head above the surface for a second, I heard our guide shout to us to head to the other side of the boat to see a sea turtle. I could not believe it. 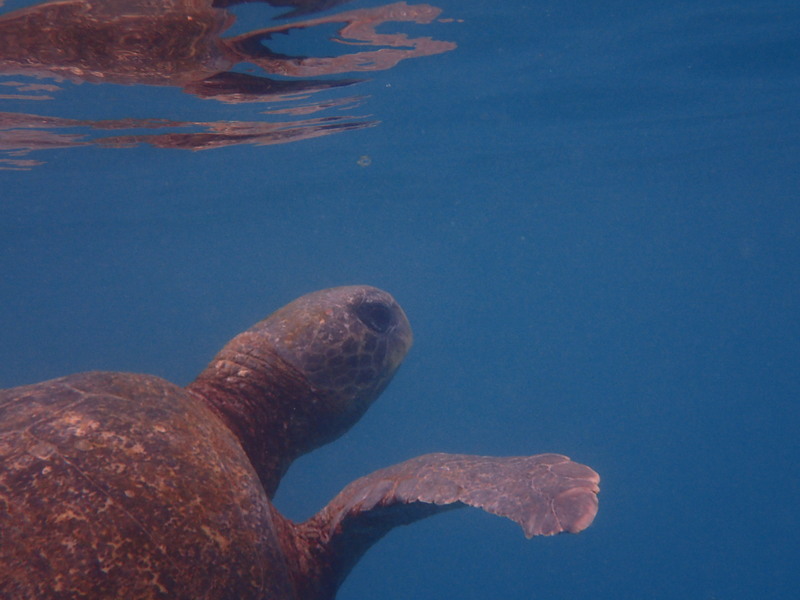 Rushing to the other side, I made it just in time to see the turtle glide up to the surface for a breath of air. My day was complete. I had been in the Galapagos for less than twenty-four hours and already I had swum with sharks, sea lions, and a turtle. I laughingly told another snorkeler that I might as well pack up and go home now. But no, I’m blessed with three more months in this paradise.